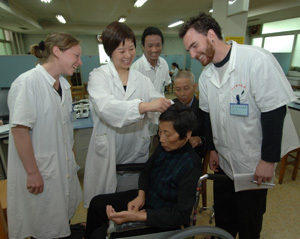 The acupuncture department is featured by rehabilitation medicine and there are various kinds of therapeutic methods, including TCM as well as west medicine to help patients recovery, such as motortherapy, direct current therapy, transcutaneous electric nerve stimulation, shortwave therapy, infrared therapy, paraffin therapy, psychotherapy, taijiquan, tuina, etc. There is no doubt that acupuncture is our unique skill. And we specialize in treating neurological diseases and injuries, such as facial paralysis, cerebrovascular accident, spinitis, neurogenic bladder, sport injury, cervical spondylosis, protrusion of the lumbar intervertebral disci, etc. For example, we have rich experience for the treatment of protrusion of the lumbar intervertebral disci and cerebrovascular accident. In China, acupuncture has been applied to lumbago for at least 3000 years, and protrusion of the lumbar intervertebral disci is one of the most common types of lumbago. As we all know, the protrusion will never disappear, but the pain, numbness along the path of sciatic nerve can be released. And based on the treatment experience, the effective rate is about 90%. Some patients who have received operation still suffer from the pain and numbness, because the nerve was injured. However, acupuncture and herbal fumigation can help nerves repair. We also have a new acupuncture method which is called abdominal needle (turtle needle). It is a painless treatment. We choose the points that are located on abdomen to regulate the whole meridian system. The second example is cerebrovascular accident. In acute stage, acupuncture and herbs can relieve the cerebral edema to protect brain tissue. While in recovery phase, acupuncture can help limbs function improve quite well. Even in sequelae stage, acupuncture and moxibustion as well as herbs can reduce the clinical complications, which is helpful to prevent the recurrence. Based on the good therapeutic effects, we have won good public praise from the patients and the prize from the government. In addition to the clinical practice, we are also responsible for training the graduate students in Zhejiang University of TCM, and there are hundreds of foreign students coming from various countries to study acupuncture in our department. Furthermore, some of our doctors give academic lectures in American,European and other countries every year.